I love mushroom soup but it doesn’t really fill me up and it’s really only a starter for me as it’s quite light (at least the way I make it). In England it’s normally made creamy and buttery but at home I make it simply with onions, garlic, mushrooms and herbs, served with a dollop of greek yoghurt on top. In Slovenia it’s made different – I had it in few places in Slovenia and every place seems to make it slightly different but what’s common to all is that they use wild mushrooms, white potatoes and some other vegetables like carrots. Their soup tends to be pretty watery as well, but it’s very tasty and I prefer it that way. One day I was in a mood to make my mushroom soup in a slightly different way. I wanted it to be pretty healthy and filling but since white potatoes are not the healthiest and the most nutritious food I decided to use buckwheat groats instead. It was the first time I was making mushroom soup with buckwheat so I decided to keep it simple. Sometimes less is more and I can always experiment by adding additional ingredients next time. 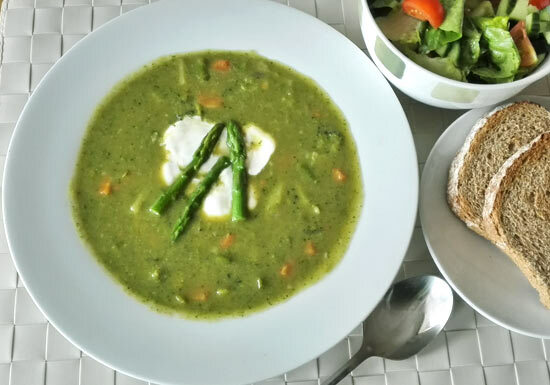 What I ended up with was a delicious buckwheat and mushroom soup which I really loved and I believe you would love it too if you try making it. 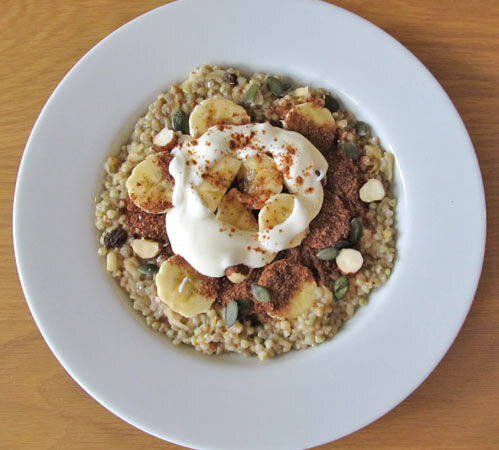 This was pretty nutritious meal as buckwheat is supercharged with B complex vitamins, magnesium, manganese, just to mention some of the of minerals and vitamins it contains. Add mushrooms and you have even more vitamins and minerals in your meal. I had it for dinner one day but I made enough for lunch next day and I think it’s great for both, lunch or dinner. At dinner time serve it with a side salad for some raw goodness. Rinse buckwheat groats to have it ready for later. Heat up enough rapeseed or coconut oil to gently fry the sliced onion on a medium heat for a few minutes in a medium size saucepan. Add chopped garlic, followed by sliced mushrooms. Cover the saucepan and let the mushrooms release their water. After 1-2 minutes uncover and stir, not letting it stick. 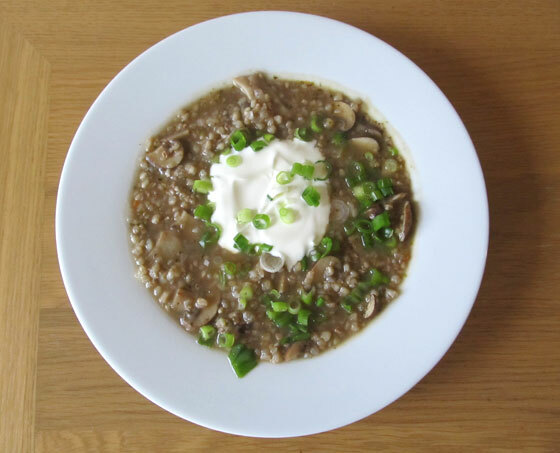 When mushrooms have visibly shrunk, add the rinsed buckwheat groats and double the amount of water. Also add vegetable stock cube and herbs. Let it cook for around 20 minutes. If the soup looks too thick add more water. Once it's ready serve with a spoon or two of natural/greek yoghurt on top and add chopped spring onions. These two additions make the soup taste really good so don't skip them! As you can see from the picture I made my soup pretty thick but you don’t have to, just add more water to make it look more like a soup and less like a risotto! If needed, add some seasoning at the end. What do you think of this recipe? Would you give it a go? If you like this recipe, subscribe to my blog updates to receive more healthy meal ideas straight to your inbox. You should definitely give this a try Alison. It’s so filling and healthy too! 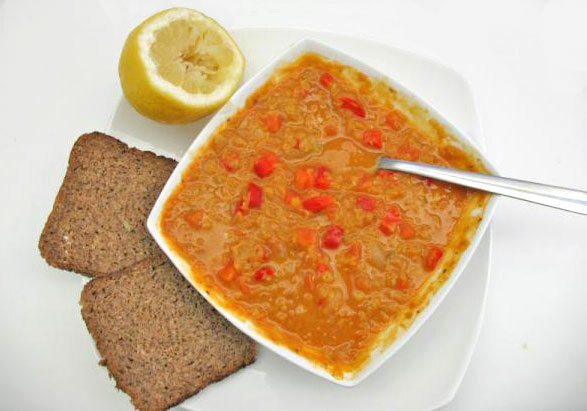 This looks delicious Petra 🙂 I like the idea of adding buckwheat for a more filling soup! Thanks Nadia! I really loved spring onions and yoghurt on top, it was delicious! Thanks Tom! It’s one of my favourite soups!